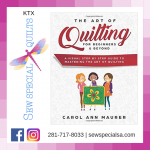 5 PowerPoint presentations scattered with hands on breakout sessions to build skills in shopping/rotary cutting, piecing,quilting. 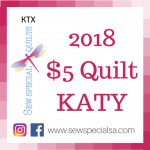 6 Skill Building Classes 1)Planning to Quilt - 2 hrs 2) Fabric Choices & Cutting - 2 hrs 3) Piecing Sashing and Borders - 2 hrs 4) The Binding and Application - 3 hrs 5) Preparing for Top Quilting - 4 hrs 6) PhD/Starting or Finishing a Quilt - 5 hrs Call 281-717-8033 to sign up for ALL modules to receive your discount or sign up online for each module you are interested in attending. 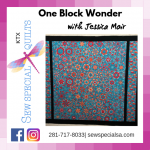 Start digging through your fabric stash for floral fabrics! 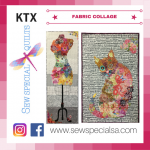 We will cut out lots of flowers to build a beautiful fabric collage quilt or wallhanging. This series is for the true beginner or for those who are looking to brush up on a techniques. 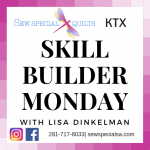 Each Monday Lisa will host a 3-Hour technique workshop on topics such as Rotary Cutting Basics, Machine Applique, Foundations Paper Piecing, Perfect Borders, and sew many more! Sign up for all or pick and choose. 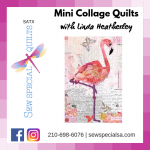 Bring beautiful designs to life by using longarm quilting rulers on your home machine. 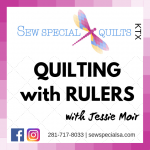 Join Store Manager, Debra, in this colorful and fun monthly sewing club. 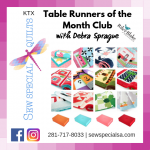 Come to club and learn tips and tricks for sewing each month's table runner. Please call the store to sign up and to provide your payment information to be charged each month. By signing up you are committing to the full 12 month program.